“Everything has been pleasant for me. So I’m thankful. And hopeful.” With those words, and a big, toothy smile, former President Jimmy Carter, 90, ended his press conference Thursday. He looked so completely, boyishly happy that you could almost forget he’d also announced he has cancer in his brain. Call it clear thinking, or mind over matter. Or simply: grace. 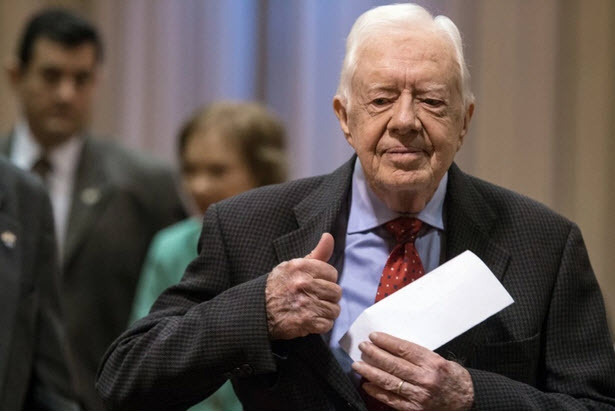 Carter’s reaction to the very bad news–the kind that could terrify and distress most of us–is a lesson in accepting what comes with the rare virtue of grace. Grace–meaning elegance, calm, equanimity–is the only strategy that make any sense, really. Disorganized emotions and raging thoughts of worst-case scenarios will only make the situation worse. Carter employed a textbook coping strategy, what any therapist might advise: Try for a balanced perspective, look at the big picture of your life, reflect on who and what is important to you. But how difficult it is to acquire such a view! Difficult, that is, unless you’re in the habit of feeling grateful, and of reflecting on all that you have to be thankful for, even in tough times. This seems to be Carter’s habit. It’s an underestimated superpower, and terrifically inspiring. Being grateful for the totality of one’s life; enjoying family and friends; pursuing meaningful work: These are the things psychologists, mental-health specialists and researchers tell us are the keys to satisfaction. “A multiple infusion of gratitude” is how Carter described his feelings–with another bright, happy smile–toward those who have gotten in touch since his cancer news first broke. Gratitude is being recognized as powerful medicine, capable of reducing stress and increasing psychological health. Studies link gratitude with lower depression and higher happiness. In studies of Vietnam War veterans, gratitude has been seen as an aid in recovery from trauma. Reflecting on the good in your life fosters resilience and mental strength. But Carter wasn’t just expressing thanks for the kindness of others and for his past good fortune. He also talked about the future–his future, and that of those he wants to help. The active humanitarian is seemingly tireless; he just published a memoir, and he monitored elections in Guyana in May. Carter didn’t talk about slowing down. He remained optimistic, saying he hoped “to extend my life as much as possible,” and he spoke about continuing to serve. His top priority, he said, was to eradicate the Guinea worm, the painful parasite in remote parts of Africa that a few decades ago infected 3.5 million people annually. Since Carter and his center have gotten involved in helping villagers gain access to clean water, the number has dropped to just 11 cases this year. “I have been as blessed as any human being in the world.